When you want to add that extra bit of adventure our guided ice climbing hits the spot. Also a good alternative for heliskiing down days. 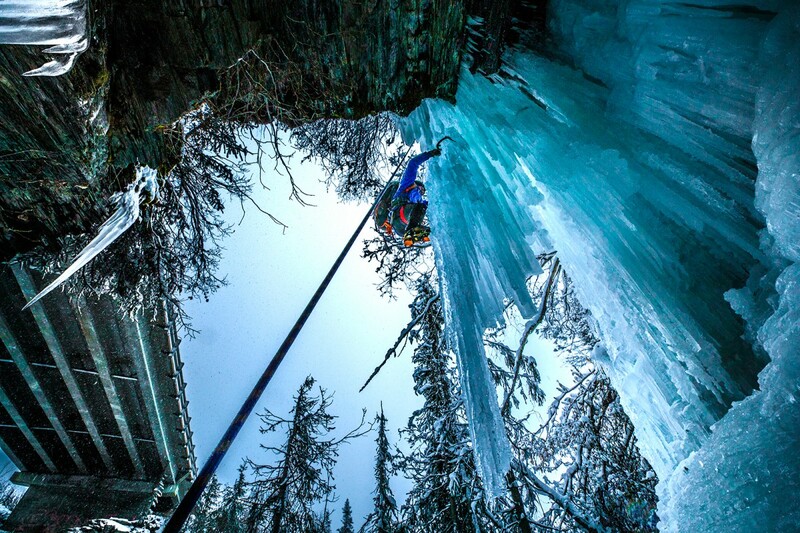 Valdez host some of Alaska's best ice climbing. Our winter ice climbing is great for beginners who are looking to get introduced to the sport or to intermediate climbers who have experience but want to try out the ice in Valdez. Most of our winter climbing takes place in Keystone Canyon however when conditions permit we can offer ice climbing on the icebergs of Valdez Glacier. Not a typical guided climbing route but a fun one for experienced climbers looking for something a little different. Early season conditions might not be as dramatic but they still make for fun climbs. Our guides are geared to guide you safely up and down the ice. Climbing the blue ice in Keystone Canyon with the Valdez Winter Ice Climbing Tour. Touring up the ice while climbing in Valdez. Some of the ice falls in Valdez offer unique features for our climbing tours. Our ice climbing tours are available to anyone 12 and up. Sometimes when the when the sky is bright we get a little night climbing in on the ice bergs. Night tours available at higher rate than day tour. Some more bells on the ice falls in Keystone Canyon. Climbing the blue ice of Valdez glacier makes for a different experience. Ice climbing is a great way to bond with the family on your visit to Valdez. Ice climbing the falls in Keystone Canyon on a Valdez ice climbing tour. Guided ice climbing makes things safe and enjoyable. Our guides are there to help you every step of the way. Doing the reach on a guided Valdez ice climbing tour. Nothing like the satisfaction of getting to the top of your first ice climbing. Climbing by some interesting features on Horsetails Falls, on a Valdez ice climbing tour. Ice climbing up POS in Keystone Canyon, Valdez.